Are you exhausted just at the thought of having to put your kids on a plane and go to the Gold Coast just to allow them to enjoy a theme park? There is no question that the big stars of theme parks are up there, but it doesn't mean we haven't got fun theme and adventure parks near Melbourne - just think on a smaller scale. For those who live in the west and south, just over an hour away is Adventure Park, Geelong, which is growing rapidly after opening its doors a few years ago. 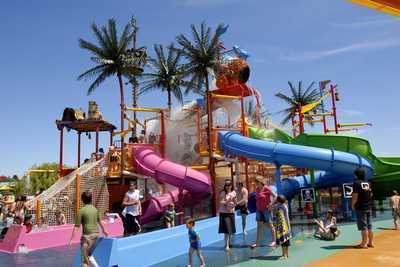 It has extensive water-based rides, including Lazy River Torrent, Aqualane racing slide, a pirate bay area, rapids, a log flume ride and a dedicated toddler splash zone. 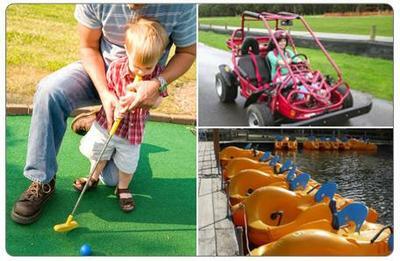 There's also electric cars, go-karts, giant jumping castles, mini-golf, archery, canoeing, volleyball and paddle boats. Entry prices are determined by height rather than age, so if you are very short (under 1.2m) it will cost just $28 for the day and $36 for the day if you are taller. Kids under 90cm tall are free. They also offer good value season passes. Get there early to make the most of it, and beware it can be very crowded on sunny summer days. If you live in Melbourne's East, think about Gumbaya Park, Tynong. Just 45 minutes from Melbourne along the Princes Highway, Gumbaya Park has both entertainment and wildlife, set in 430 acres of bush and lovely parks. There are minicars, twister karts, mini golf, paddle boats, a water slide, Australia's longest cement toboggan tracks, pony rides, tractor rides and lots of Australian wildlife for the kids to meet. There are a range of ticketing options, including an all-inclusive 'Ultimate' pass which includes entry and unlimited rides in peak times, which is $40 per adult and $34 per child. Rides may also be purchased individually for $5 each and added to the standard entry fee of $14 adult and $7 children. For those living in the north, you may well be familiar with the perennially popular Funfields, at Whittlesea. There is a fabulous Alpine Toboggan ride, go karts, a pirate ship, lots of waterslides and waterplay, minigolf and a dedicated playzone for smaller kids. Season passes are just $99, and all inclusive day passes vary between $33 for those over 142cm, $28 for those between 100cm and 141cm and under 100cm are free - patrons are obviously taller here than in Geelong! OK, so maybe our parks don't have the adrenaline scream-a-minute of the Gold Coast theme parks, but they are still a heap of fun for a family day out. Why? Sometimes kids just need to go crazy!